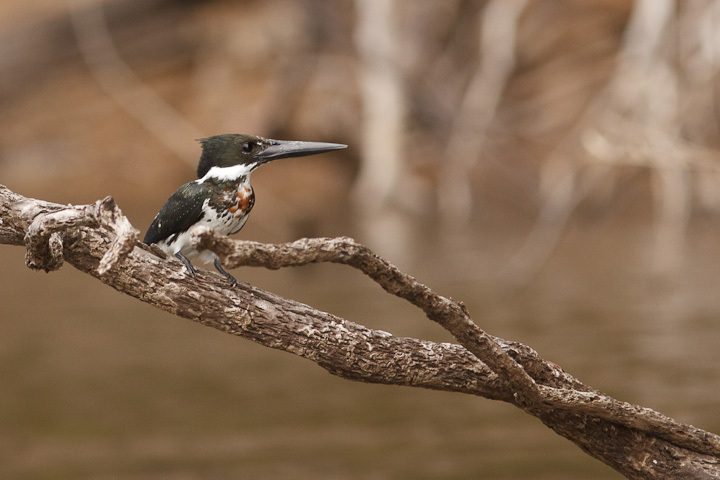 On an Amazonian river, the birds and mammals are impressive, but there is also a huge amount of nutrient cycling in the water. These rivers cover vast areas of forest where huge amounts of protein become available during the wet season. Because of this, the predatory animals along the river are very often piscivorous, feeding on fishes occasionally or exclusively. 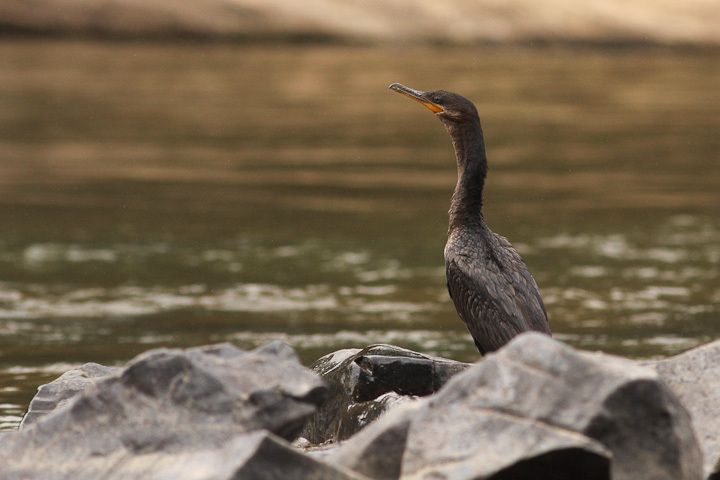 This post is a brief photo introduction to a few of the fish-eating animals commonly seen along these rivers. 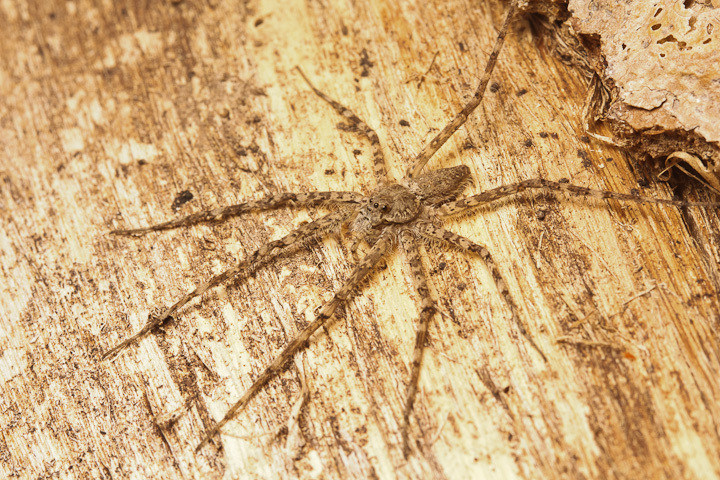 Fishing spiders (Pisauridae) were best photographed at night, as during the day they are extremely skittish and quick to hide. We did not see any giant examples, as I had in French Guiana, but I did not make a concerted search either. 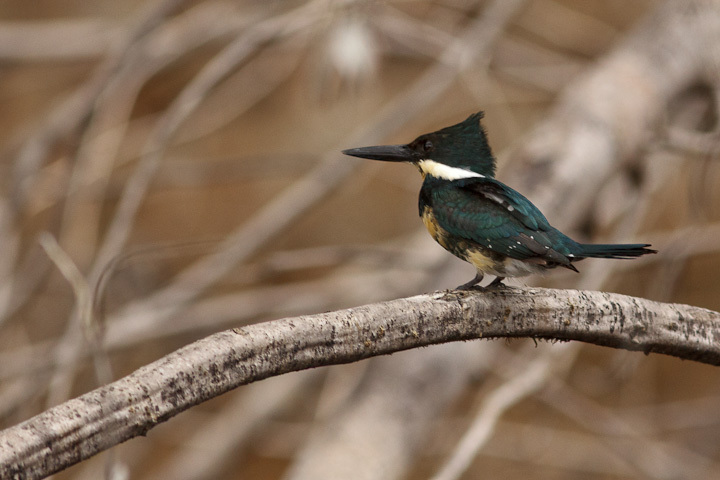 The related Amazon Kingfisher (Chloroceryle amazona), by contrast is even more robust and has a much larger bill. 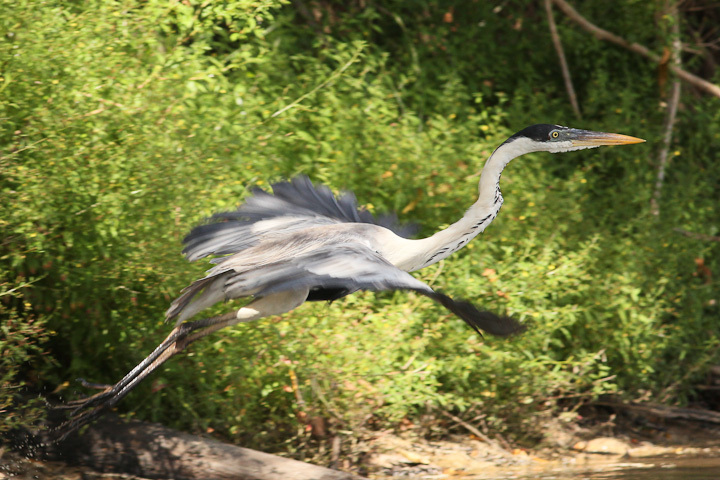 The White-necked Heron, Ardea cocoi, is the Amazonian equivalent to the Great Blue Heron. We saw a great many of these. They would often fly in front of the boat for may hundreds of metres. 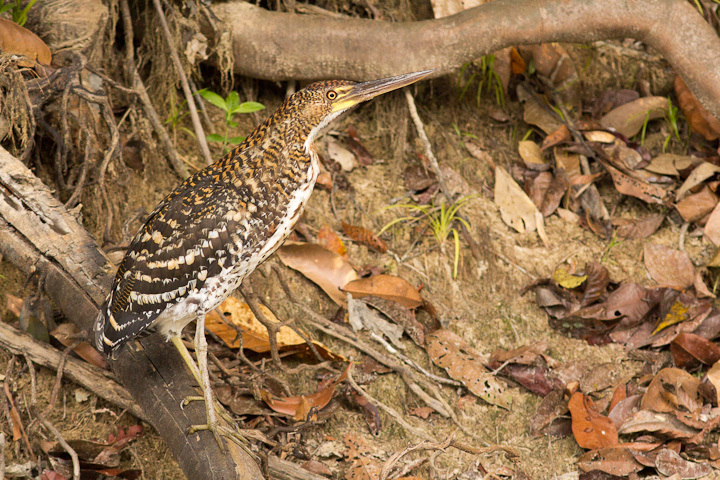 The Sunbittern (Eurypyga helias), despite its name, is not a bittern at all, but rather related to the gallinules. 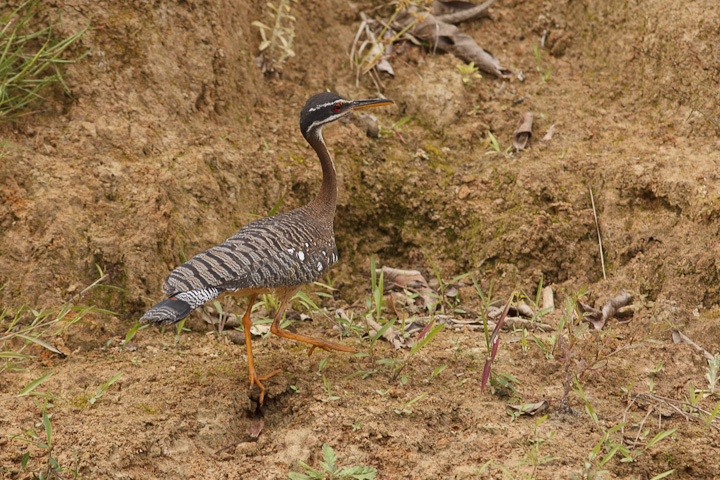 Here is a juvenile Rufescent Tiger Heron (Tigrisoma lineatum), one of the more magnificent of the Tiger Herons. 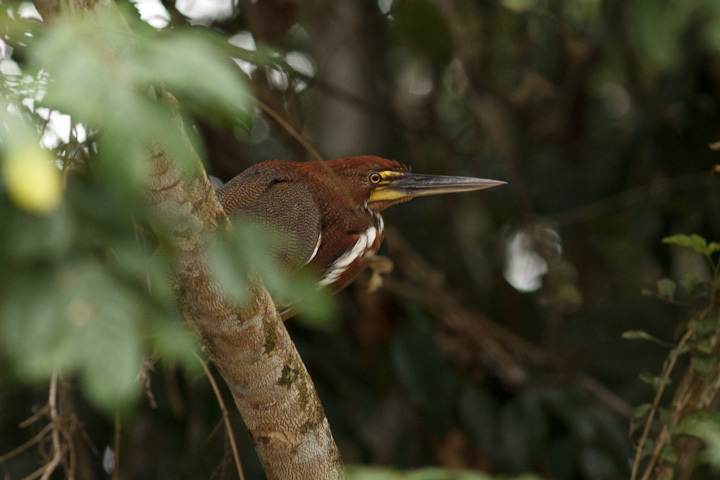 The adult Rufescent Tiger Heron is a gem. Something familiar…Sort of. 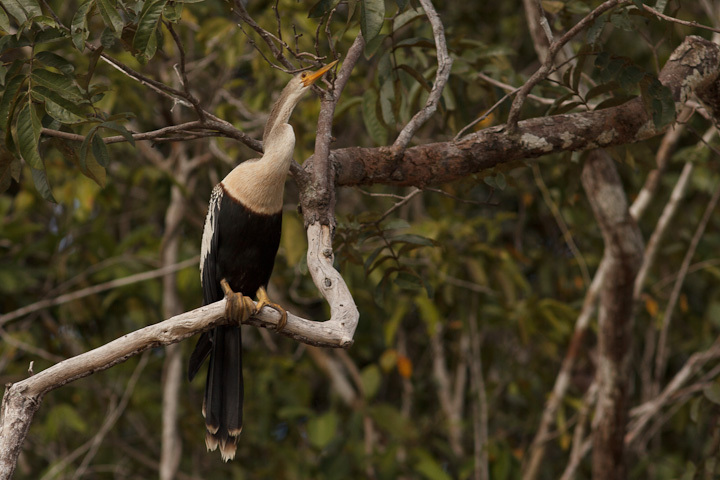 This is a Neotropical Cormorant (Phalacrocorax brasilianus). This one I remember from Florida. 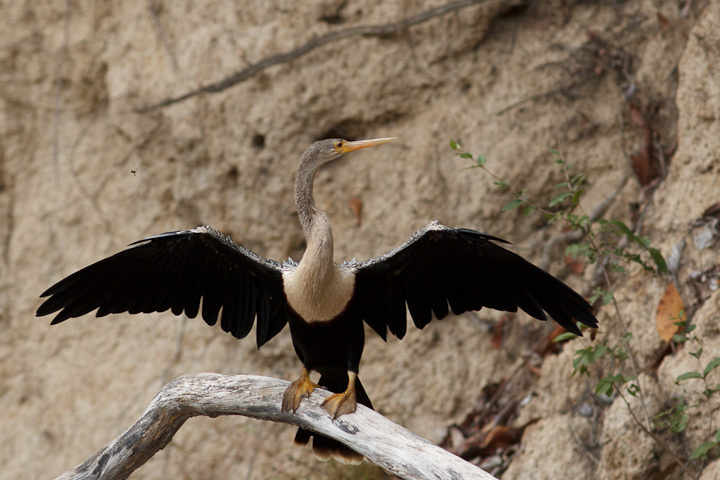 The Anhinga (Anhinga anhinga), or snakebird is like a cormorant which swims with its body submerged. Interestingly enough they also soar on thermals! 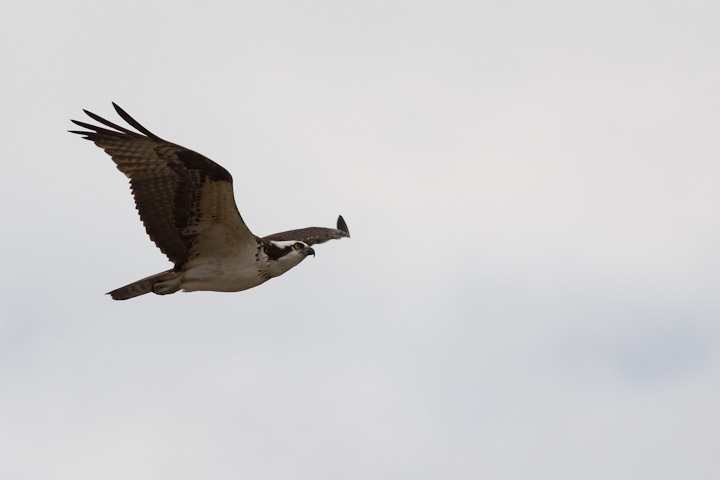 Osprey down here are all migrants from elsewhere. 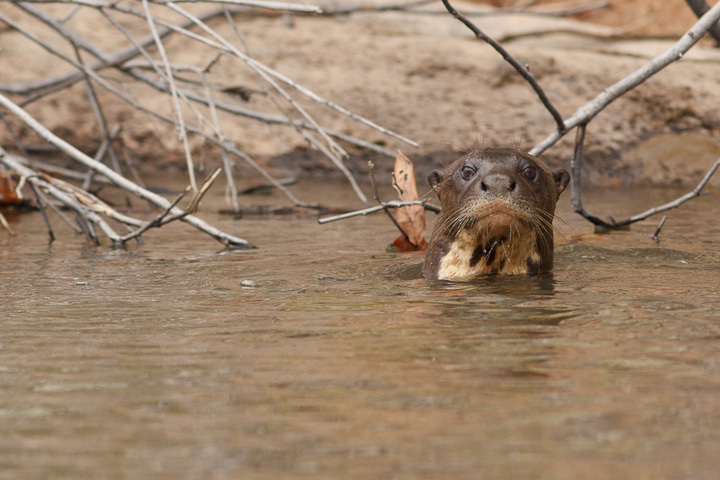 Giant River Otters (Pteronura brasiliensis) were abundant along the Rewa, always travelling in groups. 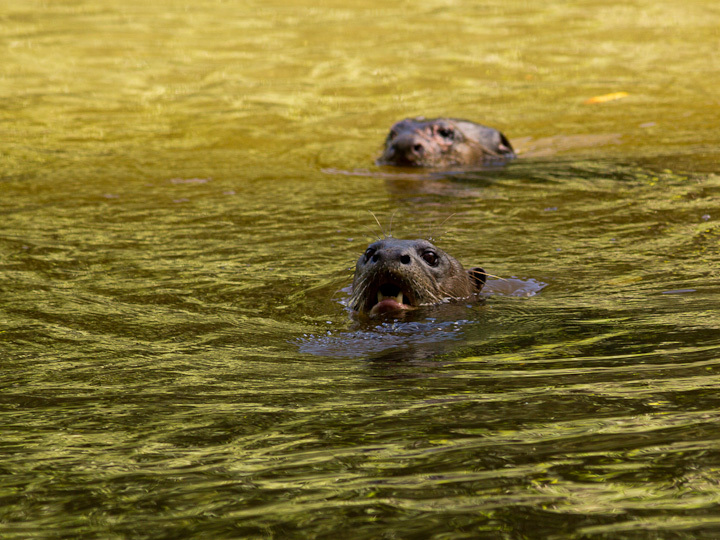 They cooperatively hunt for large fish and caiman, and have some real mustelid attitude! 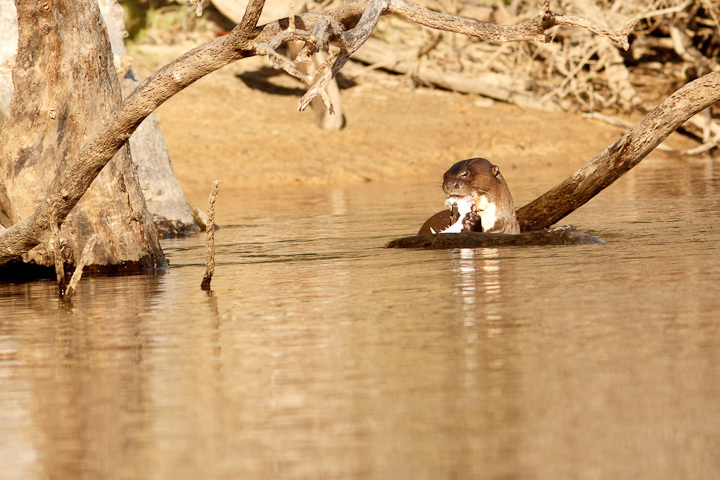 Giant otter snacking on a fish. 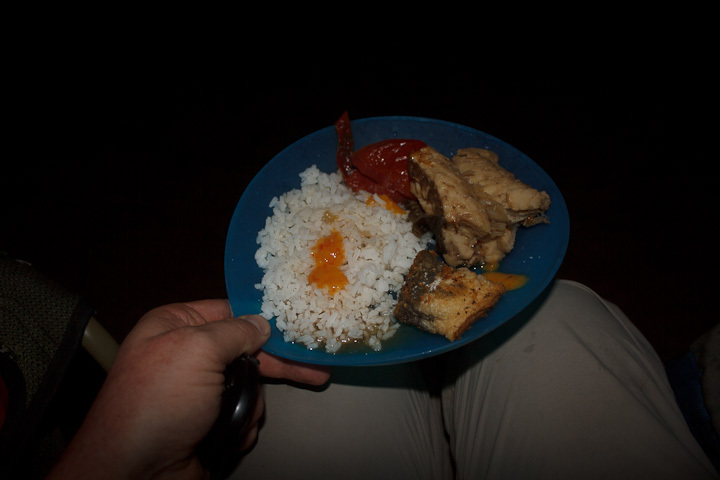 In addition to these avian, arachnid and mustelid predators, we also had to be predators in order to eat during the trip. I dislike catching fish for sport, but when it became clear that there was no other protein along for the ride, we turned to fish with gusto. 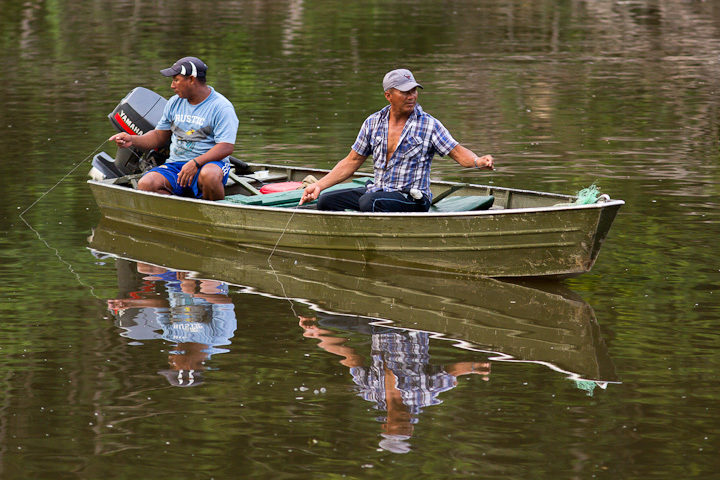 The fish along the Rewa are diverse and abundant, and can be reliably caught with simple equipment. 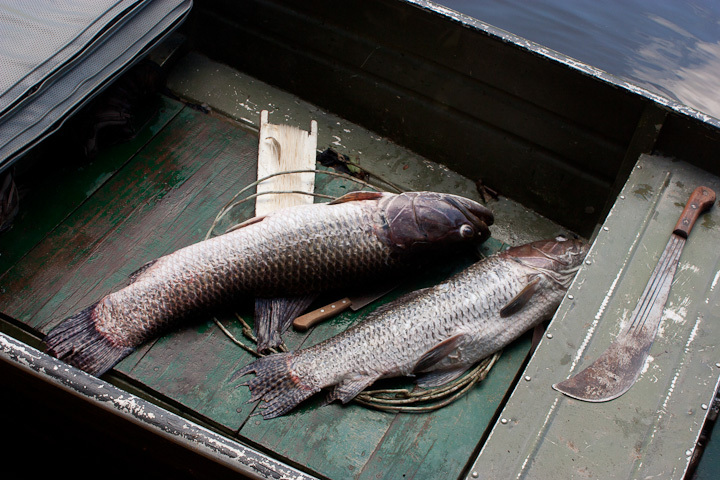 Under sustained commercial fishing, the larger fish would likely be wiped out completely, but since the Rewa has so few visitors, there are large stocks of big fish available. 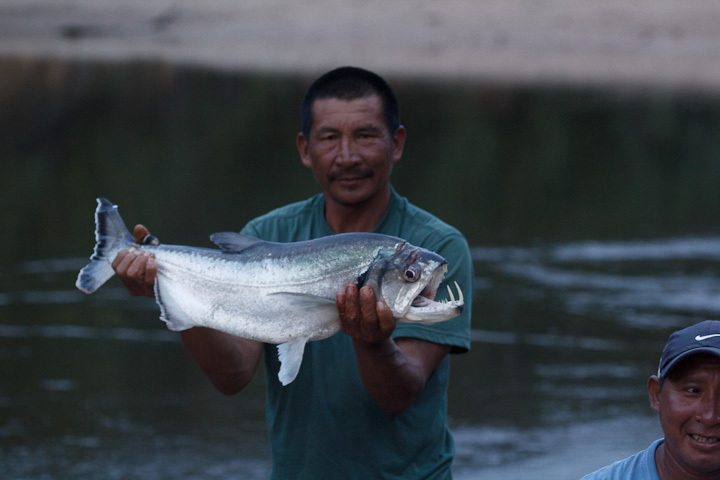 Catching fish in the dry season is especially easy, as all the fish which ordinarily would be foraging in vast areas of flooded forest are concentrated in the river. 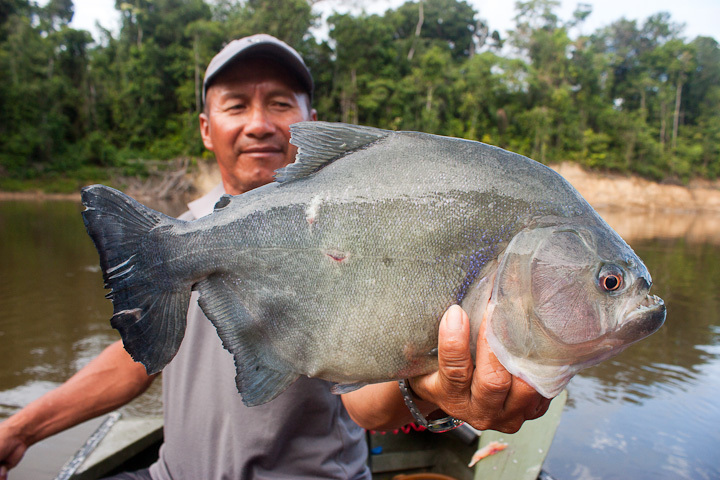 This black piranha will be our evening meal. Catch of the day: some peacock bass and something we will use as bait tomorrow. 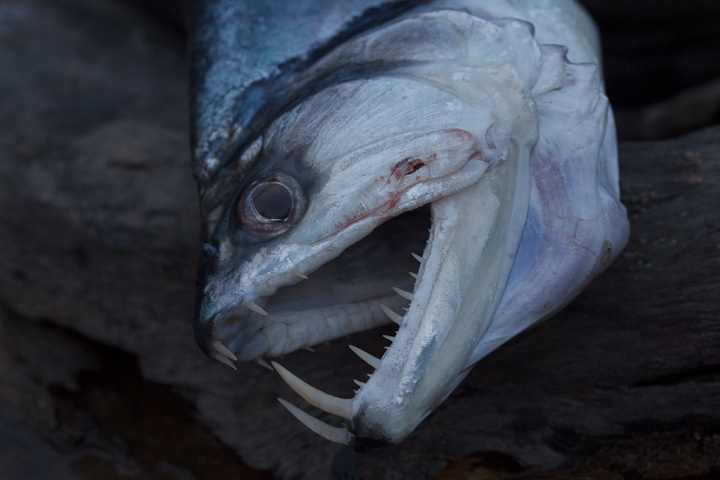 The long fangs of these fish are quite impressive, fitting into slots in the upper jaw. 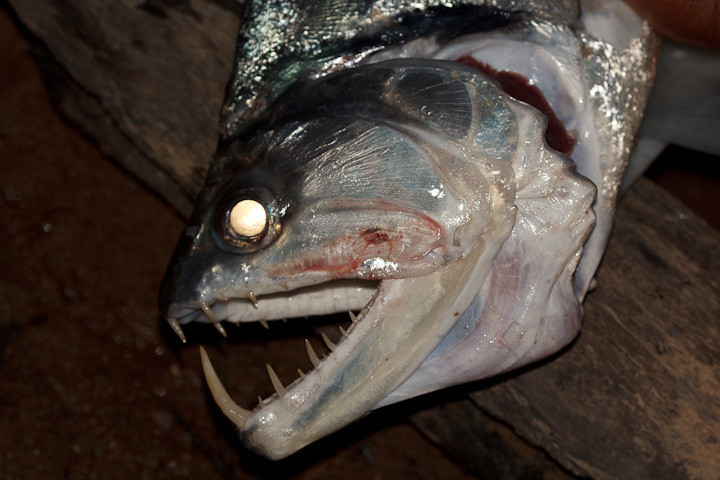 With direct flash, the fish looks even more scary! 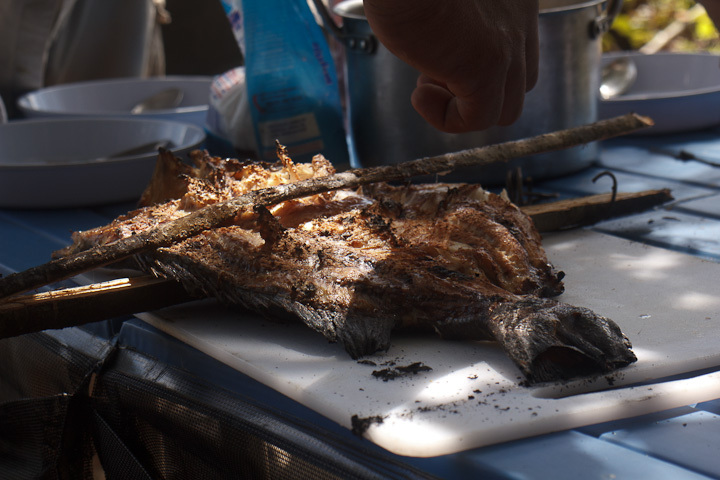 Nonetheless, the payara is good eating. We also used the head for a special project! Stay tuned for the next post! 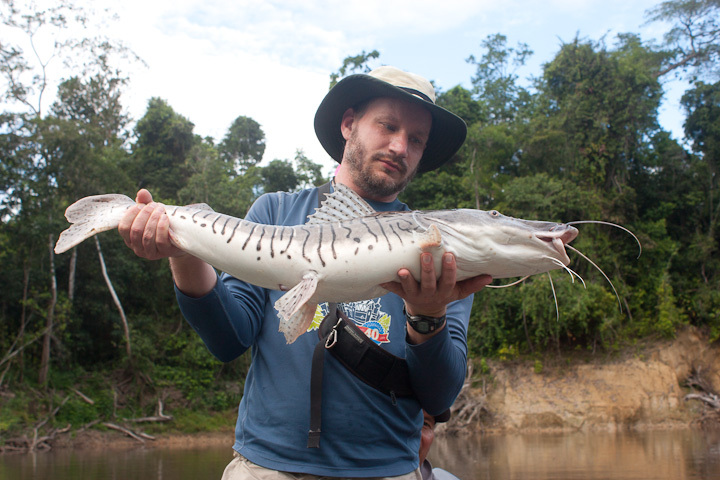 Here I am with a tiger catfish, genus Pseudoplatystoma. This is a great fish for eating, and two of these fed us for 3.5 days. Photo by Jonathan Meiburg. 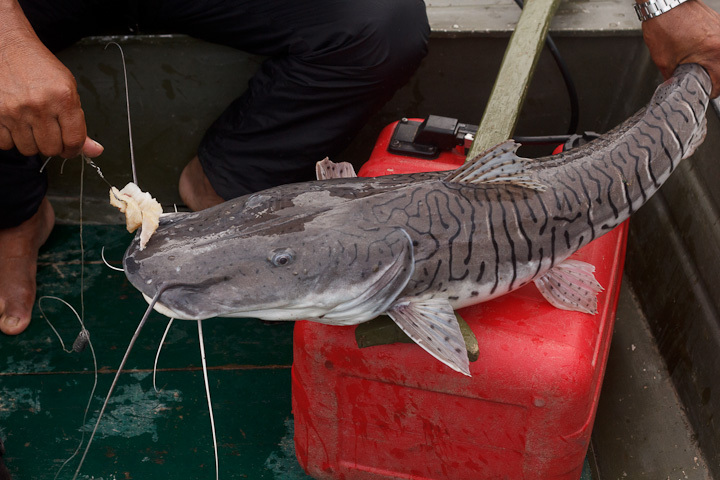 The tiger catfish are absolutely gorgeous. 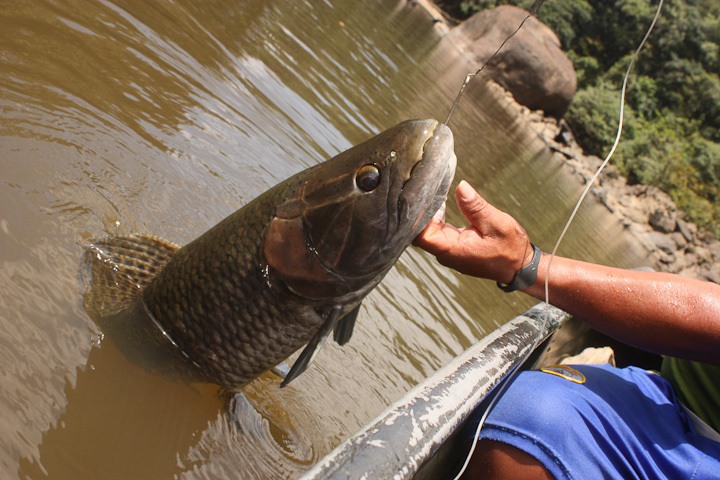 Further upriver, we caught some aimara (Hoplias aimara), which I was familiar with from working in French Guiana. 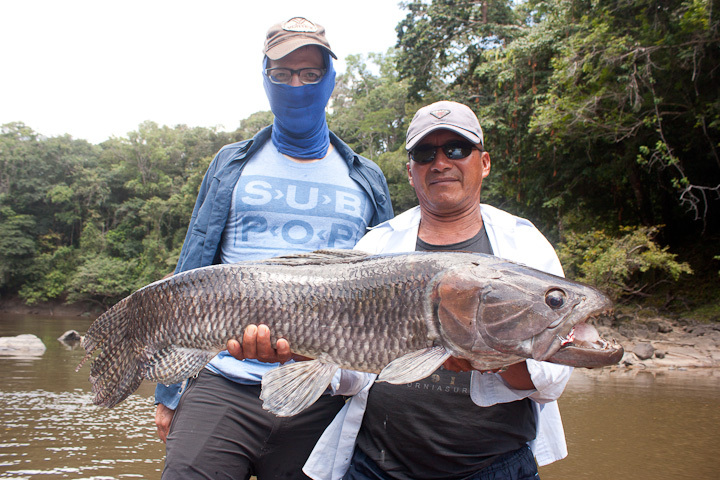 Brian and Jonathan with a big aimara. Jonathan is wearing Catherine’s home-made tubular headwear as protection from the sun, and maybe so this fish’s relatives don’t recognize him. All aimara claims for damages should be made to Jonathan’s record label, Sub Pop Records. 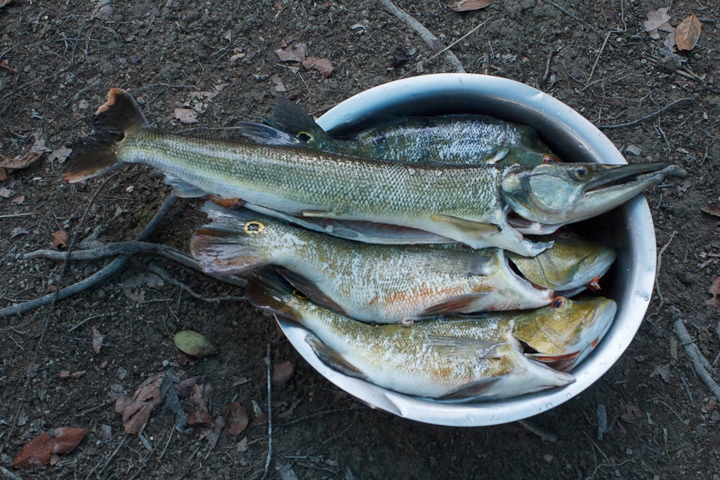 The day’s catch, with some to be dried to take home to Yupukari. Aimara drying in the sun. Stingless bees taking some of the aimara. Unlike other bees, meliponines feed scavenged meat to their larvae. Bees eat fish too!